Cuomo got a state senate that is on the cusp of going either direction just as he wanted. The IDC state senators can welch on their commitment that got them WFP to withdraw support for challengers in the general election, by rejoining the Republican conference. This is exactly what Andrew Cuomo wanted. He should be wary of getting what he wanted. The WFP, and the unions that pushed Cuomo into the WFP endorsement have painted themselves into a corner that they now have to lash out against corporatist Democrats or lose any credibility with the close to three hundred thousand voters that voted on either WFP or Green party lines which approaches the margin of victory in this election. Red meat will be demanded by the progressive voters that will not find it tolerable to support candidates just because he/she is the presumptive favorite though dismissive of the progressive agenda. 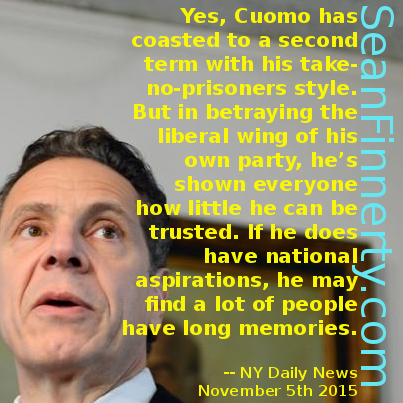 Trustworthiness is a quality that in nearly any sector of society is desirable, but in politics it is manna from heaven and Cuomo will either follow through on his commitment that gave him the WFP ballot line or burn that bridge and the possibility of national ambitions in a presidential primary. It is for certain that he can't have both, no matter how much Governor Cuomo wishes that he didn't have to be accountable to what he previously promised. Andrew Cuomo either will have to govern as a liberal or surrender the possibility of national ambitions and even re-election.